Crimes Committed: Underground connections, laundry, racketeering, piracy, escape from custody, evasion from Justice, assault of an agent. To find and beat up Takao and Billy. Become the richest woman in the world. Appearance: Over the last year, Mishi has grown. She once definitely belonged to the female area in terms of gender, but now her somewhat more muscular stature has put a damper on that. However, she still has her light pin hair, which has grown slightly down to her waist. She no longer falls behind her persona, having had to embrace the fact that she stands out a little, no longer using sunglasses and keeping to her prescription ones. 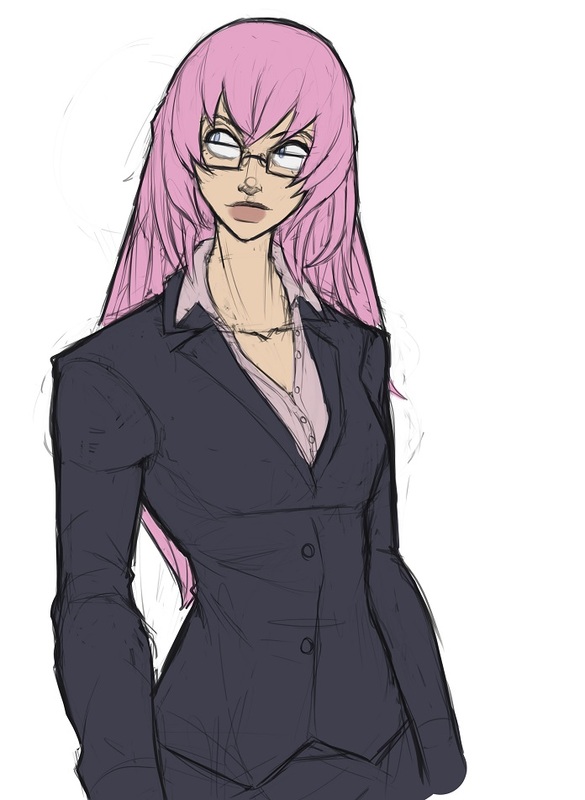 Where her business suits were loose fitting, they are now somewhat more tugged for her form. She often keeps the upper buttons of her shirts opened, revealing her lower neck and collar bone, but not much else. Her face has become more angular, with a pointed chin, her lips looking larger as a result. Her arms have grown out a bit, once again having become more muscular than before. However, she is still somewhat slender and lean. She has grown as well, from five foot six all the way up to six foot five, her time in the Grand Line having done her some good physically. She looks more confident, most likely stemming from her Devil Fruit. When using her fruit, she practically loos the same, albeit polygonised and sparkly as a diamond. Mishi used to be a person of cowardice and panic. She’s still that, but she still has some amount of bravado due to having survived the Grand Line and returned to the Blues, enjoying her mentality of being a big fish in a small pond. However, upon being confronted by a person stronger than her, she’ll promptly withdraw. This can range from when the marines come knocking, to an unhappy customer. She likes to read, from novels to a book on facts to great epics, she often reads while waiting for a potential business partner to come along. She has a good eye for quality, and as per her job, if she would come across an unsuspecting brute who has no idea he has an item of some serious cash, of course she'd try and rip him off with but a fraction of its true worth. She has a love-hate relationship with her fruit. On the one hand, it’s versatile and useful for survival. On the other, it’s not the fruit she’s always wanted, the IQ fruit. She dislikes being at sea and if on a boat she would make the fetal position in some secluded part of the ship and hope it doesn’t sink. If caught by the marines, she would often have a nervous breakdown, claim that they were harassing her and try to escape with any means possible. If cornered, she may fight back. In fact, unlike before, she will fight back if she sees no other option, finding safety in her devil fruit and Grand Line strength. She isn't below bribing people at all, often offering her capturers more than a few beli in exchange for her release. The last thing she wants is a large bounty, or, an even larger bounty. Therefore, she’ll only incapacitate Marines that attack her, rather than kill. Mishi was born the eldest child of a rather wealthy merchant whom had been known to have dubious connections, but as a kid, of course she did not understand them. And, of course; the merchant had wanted a son. She had always wanted to show her worth and please her father, but two years after her birth, another child made its way into the family, and unlike her; it was a boy. The father would prefer to converse and pander to the child, while the nanny and mother took care of Mishi. Rather than sit down and learn how to knit, she decided that rather than try to gain her fathers' appraise simply by being his daughter, she would try to impress him. She began to learn how to read, and write; at the age of five, driven by jealousy and, strangely, hope; for she hoped that she could gain his affections one day, hope that she would be able to make him happy, and then SHE would be the one, sitting there, next to her father at one of his meetings, he would introduce HER to the other merchants and they would treat HER as an equal, rather than just a thing to smile at, wave or ignore on their way to the boardroom. At the age of ten, she had been appraised by her mother and various baby-sitters for her writing skill, and her intellect at her age. She ignored her brother most of the time, shutting herself away in the library to continue with her study, while he went to play. It was different soon, though. Her father came into the library with the brother, patting him on the shoulder and telling him that it was time to begin studying. She was sitting on one of the large chairs, so he couldn't see her. He told him about how he would inherit his business, his 'empire'. Of how he would bring his father great joy as he sat in retirement. Her brother asked what would happen to her, she couldn't see what he did, but she guessed that he shrugged. He then said the words she had never hoped to hear. "I'll marry her off, maybe.". Announcing that he would start tomorrow, they left the room. Her hands quivered, as she set down her pen, just sitting there. How could he forgo her years of studying? She began studying three winters before her brother had even began to learn to write. And he had the... The... Tears began to flow freely down her face. It was her fault, she was too wrapped up in studying she forgot what she was studying for ages ago. The affection of her father? To take his business empire? What was it all for? It felt like just one of the novels she read at night, she was just going to be wed off to some husband, and she wouldn't like it. She would try to fight it, and the prince or hero would come along and save her. There would be no hero. She never went outside of the mansion. She was no princess, in fact, she didn't even know how well-known her father was. She steeled herself, picking up the pen once more, she continued to study non-stop until she read herself to sleep. By the age of fourteen she understood math equations and had a shrewd mind for business. Finally emerging from the library, leaving her bored, lazy brother; who she was quite sure was making another paper aeroplane behind. She made her way to her fathers' room. Opening the doors, he blinked at her as she walked over to him, and set her book down. It was the fruits of her labour, complicated maths problems, business propositions, what to settle in, geographical locations best suited for crops, by now she was sure she was smarter than most of the males in the house, or even on the island that she had never explored. Flipping over the pages, her father had raised an eyebrow, before smiling at her. He told her that she could attend the next meeting if she wanted, and her whole world lighted up, hugging him, she skipped to her room, leaving confused servants, for she never behaved like this before, she felt like the heavens had opened up to her. She opened a window, and looked out of it for the first time in.. Goodness knows how long, and smiled. She had finally gotten into one of the meetings, sitting herself down, she nodded in respect to all of those whom had attended. To be honest, she thought they looked a little bit... Shadier than she remembered, but she introduced herself anyways to them, as they began with profit margins, the market on crops, shaking down the farmers... Threatening them... Stealing from.. other merchants... What? She blinked at her father; he kept pushing his index finger against her mouth each time she tried to question what was happening. Eventually, he announced that he was going to teach her how to "fence", she remembered reading about a sword style fencing, but it seemed out of place to what they were talking about. He then said that he would place her into the company, nodding slowly, she guessed that was what she wanted all along, but it felt kind of... Sour. It turned ou that the company wasn't what she thought she was, even if she didn't really know what it was to begin with, if that made sense. But... Whatever happened, she supposed she was happy, as she went into the private library with her father, and he showed her a book to read. Five years later, at the age of nineteen, she had a fair knowledge on how the criminal underworld worked. She was ready for her first assignment, she had read the books, but all she needed now was the experience. Though, she wished she could get one thing before going out with it, the IQ fruit. She remembered it very well, in a (though outdated) devil fruit encyclopedia, without pictures as to what it looked like, though. It would heighten her IQ, sense other peoples' emotions... And for what? The loss of swimming? She couldn't swim to begin with! She would almost taste the fruit, though it wasn't a good thing. In all ways, in her line of work, it shouldn't be hard to find it on the black market or at least, find someone WITH it. She smiled as she stepped outside, and off to meet her client. She was a fine fence indeed, she sold many a jewels and other valuables over the year, her future looked quite bright indeed, as her father even patted her on the back, though she couldn't shake off this feeling... One day, when she walked towards her fathers' study, she found a man next to him, he looked all right, she supposed, dark hair, nice smile. He introduced him to be her husband. Mishi was running. She didn't climb the ladder, make all of the transactions and so on just to be some guy's wife. No. She wasn't having it. He used her just for another one of his schemes. She should have remembered. She shouldn't have forgotten, and now; ironically, she WILL forget. Forget about her family. She knew she was being harsh with the whole situation, but... Still. She won't give up the life she knew so far just to make some other guy happy, call her selfish, or whatever you want, but it was time she started to look towards her own interests, she was too smart to just sit down and accept it. After hitching a ride with her previous earnings on a commercial ship, she soon found out that her family had placed a bounty on her, to be returned -alive- back to her house. She couldn't use her own name anymore. She's had bad luck so far, she named herself Fortuna Adversa, which meant just that. She got herself prescription sunglasses and found herself as a petty criminal for a small ring of underground ones. The man she worked under thought himself to be quite big, he was stationed in the north blue and lived on top of a mountain which hung precariously off the edge over the sea. He was fine, she was good, she gained some praise for her intellect when it came to robbery and heists, until another year later, when she was caught. Not only caught, but she was caught badly, with a few false charges on her, for there was another crime ring around, and they rigged the entire operation, set fire to the bank, and guessed where all of the blame went to? She was eventually broken out of prison, to which she had gained a bounty on her head for doing so, she never quite allowed them to take off her sunglasses for the few hours she had to spend in there, they allowed her to keep it on under the argument that they were prescription, however, when it came to her mugshot; she had to duck, weave, kick and do anything within her meagre power to dance around her guards before the wall shook, and the prison break-out began with her boss at the lead. In the end, they DID manage to take them off, but she was given new ones, and the only picture they could get of her was afterwards, with her running away with the rest of the "gang". She was marched up to the mountain, still in chains, which she was quite suspicious about, and they sat her down in the middle of the room. The boss had told her that she had failed him, blah blah blah. She probably shouldn't have been so carefree, though. She could have died right there and then, though... They decided to crush her spirit instead. He held up a weird-looking fruit, and told her it was the fruit she had been said she would want nothing more for than in the entire world when she first entered the ring. The IQ fruit. He said that he didn't want the mistake of being arrested to ever happen again, allowing her to taste its vulgar flavor. After she had taken a bit, he snapped his fingers and his subordinates tied ropes around her upon the chair, and then he placed a respirator-like mask with a tank of oxygen around it. Grinning at her, she asked what he was doing, he just replied that he was making sure that he could have complete faith. He would break her spirit for punishment. "See you in a few days." and the door beneath her opened up. She fell down into the sea, it wasn't too deep, but she felt weakened, she couldn't do anything, she couldn't use her new-found IQ powers to find a way out of it, she didn't feel different at all, all she could do, was feel weak, terrified and watch the fishes swim around her. Panic settled in as she reached the bottom, as she was subjected to terror, and some kind of craving for something she didn't even understand what she was craving for. After what felt like an eternity, she was hoisted up by the same man who subjected her to it. He was right, he had broken her spirit, she felt like dirt, and it was even worse when he told her that it wasn't even the IQ fruit she had gotten at all, it was just some vulgar-tasting fruit. They probably injected her with some kind of muscle-weakener or something. It soon wore off, and her fever settled in, which kept her bed-bound for a week, her boss speaking to her like he would a naughty child, trying to tell her that it was for her own good. Now that she didn't feel like hell, a burning anger rose forth from her, and once again; as she worked for him "faithfully", she eventually found a way to escape, and popped into the first ship she found, albeit uncomfortable due to the terror of being put into the sea again, and she didn't even have a mask to protect her. All she had, was a nice, large bag of beli she stole from the boss, who was probably screaming in anger by now. After a few more run-ins with the law, Mishi came across a person named Takao, and then Billy. They had a few adventures across the Blues, having to face Marines, gangsters and pirates alike. Eventually however, they escaped onto a commercial/marine/government ship to the Grand Line. After beating up Takao a few times for his mistake, they had yet more adventures in which she grew stronger, somewhat braver and more annoyed that she was there at all. However, to her delight, she was able to gain yet more underworld contacts. The friction between her, Takao and Billy came to a head when one incident ended in Billy accidentally shoving a devil fruit in her mouth. With her eating it by reflex. After beating up Takao and Billy further, she decided to leave them, as they had messed up her plans with their shenanigans, leaving them and returning to the Blues. On her way home, she found some amount of disdain and appreciation. However, the fact that they took away her dream of having the IQ fruit left her yet still annoyed- annoyed that she didn’t beat up the duo more. Grandline Survivor: Mishi, having survived up to and in the Grand Line, is tougher than she looks, also having managed to crawl back to the Blues. She is strong, has high strength, dexterity and speed but most of all, she is tough to take down even without her devil fruit. She can withstand enormous amounts of damage before falling unconscious, though this is mostly for comedic relief, as she WILL most likely take hits from the shenanigans of others, should her strength ever go to her head. Sharp Eyed: Years spent in paranoia has honed Mishi’s eye for danger. If anyone’s acting suspiciously in her presence, she’ll most likely see it unless they’re rather experienced at it. However, this comes with a downside, as she may decide someone’s suspicious even when they actually aren’t. Heavy Sleeper: So much so that this could be considered an ability. Mishi can sleep through almost anything, barring of course significant physical harm. She can and will most likely sleep through a beating, due to her outstanding resilience. ~Bags of beli stashed around her person. ~A box for her spare glasses. ~A business ledger with prices, things she has sold, things she has brought, also with her contacts and other various names in the business. Weapon Description: Rather standard, sometimes malfunctions. Weapon Special Abilities: It sometimes malfunctions, rendering it unable to shoot until reloaded. Weapon History: She brought it from a shop at half price. Devil Fruit Abilities: A particular fruit, this allows the user to turn into mochi at higher levels, akin to a Logia. However, it obviously isn’t one due to not being made of an element. Mochi is sticky, but can lose much of it to liquids. It can also be eaten. -The user gains intangibility with one limb, whether it be an arm, leg, head, chest etc. -The user is able to generate endless amounts of Mochi from his or her body. -The mochi is sticky, and able to hold on to substances or people. -Due to its stickiness, it can stretch much akin to rubber or elastic, depending on the consistency. -The mochi is sticky enough to hold down a strong human. -The user is able to create small, simple objects with hardened Mochi. -The user is able to turn half their body into Mochi. Upper or lower body. -Parts of the body turned into Mochi becomes stickier and able to stretch far. -The mochi can become stickier or harder, now able to create simple structures with hardened Mochi. -Sticky mochi becomes stronger, able to hold down someone in equivalence to a giant in strength. It still loses its stickiness. -The user is able to heat up their mochi to scalding temperatures. -The user gains intangibility, turning into a person of mochi. -As a Mochi person, the user can stretch their body when made of Mochi, and turn the mochi or themselves into objects. -The user can now make more advanced mochi buildings or objects out of hardened mochi. -The user can now change the flavour of their mochi, from strawberry to raspberry. -The mochi can be sticky enough to hold down multiple strong giants. -The user gains the ability to turn non-sentient objects around them into mochi. -If doused in liquid, the Mochi can lose much of its stickiness. Mochi Mochi: Shield Mishi spreads an arm or her arm around her body or up to two people beside her, creating a sticky Mochi shield that entraps objects flung at them. The consistency is strong enough to halt regular bullets and thrown weapons. Mochi Mochi: Bullet Mishi rubs her hands, rolling up a ball of hardened or sticky Mochi in her hands, before propelling it toward the opponent at high speeds. Neither the hardened nor sticky Mochi is able to penetrate skin, so it’s more of a blunt force attack, able to knock the wind out of someone. Or knock them out completely if it hits their head. Mochi Mochi: Hostage Taker Mishi turns one of her arms into sticky Mochi, wrapping it around someone and forcing them to “stick” with her. Mochi Mochi: ESCAPE! Mishi pushes her hand up to the highest nearest and avaliable area, throwing a wad of sticky Mochi toward it. As soon as it hits an area, it contracts, pulling Mishi with it and off to safety. Mochi Mochi: Bounty Shield Mishi creates a mask out of hardened Mochi. It is a simple mask. Mochi Mochi: Megapunch Series: Single Mishi sends a strong punch toward someone’s stomach or face, often sending them even farther due to the augments given by the Mochi. Run Away! : Mishi hightails it. If someone’s next to or near her, she may throw them at her pursuers as a form of defence. Beat Up: Mishi only does this on friendlies when they’ve done something stupid, or enemies in which she’s sure she can defeat. She lands a comedic amount of blows upon a victim, most likely bruising them. Megapunch: Often coupled while augmented by her devil fruit, she can do it all the same without it. She gives a strong punch to someone’s stomach, giving more than enough power behind it to send a regular human flying.